Upgrade to a paid subscription you’ll have unlimited access to every one of our sustainable agriculture publications, with no restrictions! All of our publications can be downloaded as printable PDFs. Plus, a good majority can be read online in webpage format. If you’d like us to mail you a copy, just pay $3.00 shipping and handling. Note: NCAT charges a minimum of $3.00 shipping and handling for any printed publication(s) mailed to you, regardless of subscription status. Our library contains almost 300 easy-to-read titles covering organic production, livestock, horticultural crops, business and marketing, farm energy, water and pest management and more. 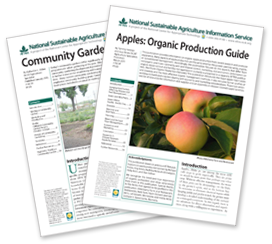 Our publications are written by our sustainable agriculture specialists, who are experts in their fields, and are meant to help farmers, ranchers and others involved in sustainable agriculture. Please browse our master publications list to learn more about the kinds of resources we offer. Subscribe Now to get access to our entire library.